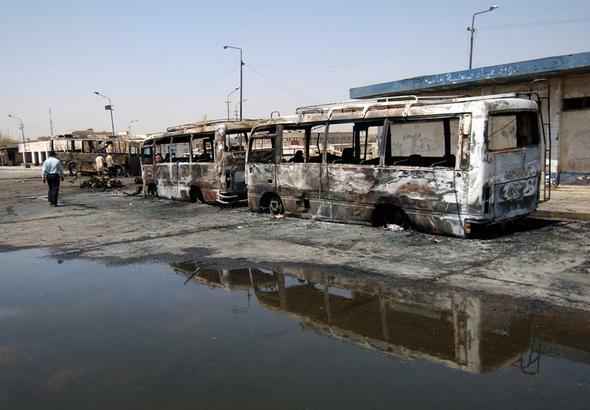 Bombed buses at the Nahda bus station, Baghdad, following an August 2005 terrorist attack that killed 43 people. Photo: US Army Image. New data released on 1 December from Action on Armed Violence (AOAV) shows that the number of civilians killed and injured globally by explosive weapons has increased by 20% each year since 2011. AOAV’s data – which is collected by compiling reports of casualties found in English language media sources – recorded 102,698 deaths and injuries globally from explosive weapons, of these some 79,600, or 78%, were civilians. Because of the nature of explosive weapons, and the challenges faced by journalists and casualty recorders to gather data on victims, it is likely that even these alarming figures are an underrepresentation. The data highlights the need to limit the use of explosive weapons, specifically in highly populated areas and provides ‘incontestable evidence that explosive weapons are being used far too regularly where civilians are at risk’. Iraq, Syria, Pakistan, Afghanistan and Libya were the most affected countries from explosive violence. Casualties from explosive weapons have been reported in 88 countries and territories worldwide. Of all people harmed, about a third died - some 35,809 civilians. 34 countries saw over 100 civilian deaths from explosive weapons. Ballistic missiles have proven the most harmful of all explosive weapons, with 46 civilian casualties recorded per incident. Improvised explosive devices were responsible for 66% of civilian casualties from explosive violence recorded by AOAV. In Iraq 92% of civilian casualties were caused by IEDs. Every Casualty spoke to report author, and head of the Explosive Violence Monitoring Project at AOAV, Rob Perkins. How long has AOAV and the Explosive Violence Monitoring Project been monitoring and recording data on casualties of explosive weapons? AOAV began to record the impact of civilian casualties in October 2010. We now have a dataset of over 10,000 incidents of explosive violence. Spanning four years and 88 different countries and territories, our data shows a clear and consistent message; civilians make up the vast majority of casualties when explosive weapons like bombs and rockets are used in populated areas. Why did you feel it was important to start recording this information? The project was conceived in response to a call earlier that year from UN Secretary-General Ban Ki-moon for more systematic data collection to try and illustrate the extent of humanitarian harm from explosive violence. AOAV was formerly called Landmine Action, and we had a legacy of campaigning against the most appalling explosive weapons like anti-personnel landmines and cluster munitions. We remained concerned that other weapons that share the basic principle of affecting an area with blast and fragmentation might also be having a significant and underreported impact on civilians. Our work has been aimed at revealing the contexts in which civilians are most at risk from explosive weapons. What has the response been to these reports, and to your data? Do you see it making an impact? Very much so. Over the last few years a strong and strident international community of concerned states, international organisations and other NGOs has come together to call attention to and try to reduce the humanitarian impact of explosive violence in populated areas. In March 2011, AOAV helped to found the International Network on Explosive Weapons (INEW), which is calling for a political solution to end the use of explosive weapons with a wide-area effect in populated areas. To date more than 40 governments have spoken out, many citing AOAV’s data. Our data has been pivotal in building a case against the use of these weapons in such contexts. It shows starkly that this is a continuing and eminently predictable pattern of harm, and it has provided compelling evidence that there is an urgent need to do more to reduce the cost for civilians. The UN Secretary-General has repeatedly cited AOAV’s research in his addresses to the Security Council on protecting civilians, and has made tackling this problem one of his key humanitarian charities. The UN has been heavily engaged in the issue, as has the ICRC, whose staff see the impact of these weapons on civilians on a daily basis on the ground. Briefly talk us through the process of recording, what does it look like on a day-to-day basis? We record our data using English-language media sources. We run a tool that sweeps the internet for stories relating to explosive weapons, capturing as many as possible that discuss bombs, shelling, mortars, and others. Each story is highlighted if it also makes reference to death or injury in some way. For an incident to be captured we require a date under 24 hours, a location, and at least one casualty (we don’t record threats made or failed attempts for example). Every story in our online reader that relates to a particular event, for example the shelling of a marketplace in eastern Ukraine, is opened and analysed. AOAV has a codebook that guides the selection of sources (up to three) from which to record an incident. We then enter into our database every detail we can relating to the time and date of an attack; the country and location; whether it took place in a populated area (as in our hypothetical market example); who was responsible; the deaths and injuries sustained (including whether each casualty is reported to be a civilian or not, and whether they were females or children); the weapon involved and its launch or detonation method. Very often not all of this information is reported clearly, but we extract as much as we can as we try to understand exactly what may have happened in a given incident. You get most of your information from media reports. What information is essential for journalists to record about an incident in order for their reports to be useful to your data collection process? No incident can be recorded by AOAV if it is reported without a clear location, a specific date, or a number of casualties. I am frequently forced to disregard events where ‘dozens’ were killed or injured, or ‘weeks of shelling in Homs kills many’, for example. It’s frustrating because these casualties can’t be recorded as they deserve to be, there stories can’t be part of our data. It means we know we don’t have every incident or casualty captured, and that our data can only illustrate the scale and pattern of harm. It’s also a source of much frustration how rare it is for journalists to describe the casualties of an attack in detail. While we record the presence of women and children where it is reported, it is very infrequently included in a dispatch from the ground. Partly this is a result of access issues, as well as the catastrophic nature of many explosive violence incidents, which makes it hard to even identify the victims. But it is something I would like to see reported far more often to help us better reflect the true and terrible toll of explosive weapons in populated areas. AOAV’s Explosive Violence Monitoring Project, which records the casualties of explosive violence worldwide, supports Every Casualty’s efforts to ensure the recording of every casualty or armed conflict. AOAV is a member of our Casualty Recorders Network and has co-authored a recent report with Every Casualty entitled, Casualty Recording: Assessing State and United Nations Practices.